Congratulations Democrats, you made us number one; not in business climate, not in education, not in job growth, but in welfare benefits. 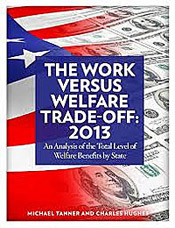 According to The Work Versus Welfare Trade-Off: 2013. An Analysis of the Total Level of Welfare Benefits by State, from the Cato Institute in Washington, Hawaii ranks #1 among the 50 states in total welfare benefits. The study states: "In Hawaii, that translates into a 2013 package of $49,175 — up $7,265 from an inflation-adjusted $41,910 in 1995." More surprisingly is how this compares to the working class and the kind of negative message that it sends. 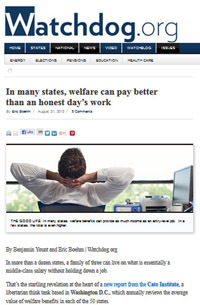 When welfare is stacked up against job salaries the study showed this: "The authors found that in 11 states, 'welfare pays more than the average pretax first-year wage for a teacher [in those states]. In 39 states, it pays more than the starting wage for a secretary. And, in the three most generous states a person on welfare can take home more money than an entry-level computer programmer.'" Senator Sam Slom's prescience regarding welfare in Hawaii has been picked up by Watchdog.org: "Sen. Sam Slom, R-Honolulu, minority leader of the Hawaii State Senate, and the sole Republican in the chamber, said the study's results are 'not surprising' to those who have followed recent increases in total welfare benefits and expenditures." SLOM: "I said in a public hearing several years ago that within a few years, our human services welfare costs would surpass public education in Hawaii. This came to pass late in 2012," Slom told Hawaii Reporter. 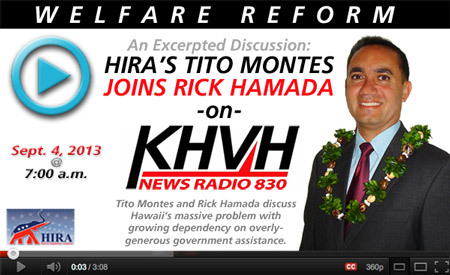 "It is a shame that Hawaii has such huge governmental costs and tax burden, which in turn creates more of a welfare class and the growing inability of a middle class to sustain themselves, let alone to privately assist the less fortunate." Democrats do not believe that money in the hands of working people can benefit the poor. Rather, they believe the government should take this money from "the rich" (a subjective moving goal post) through taxation and redistribute it to the poor. This difference in belief is the root of much of the economic suffering here in Hawaii. When a private enterprise makes a profit, this money is used to pay employees, suppliers and contractors — usually lower and middle class people. When the profit does reach the store owner, this wealth is injected back into the economy in the form of investment or spending (money held in savings is actually invested by banks). 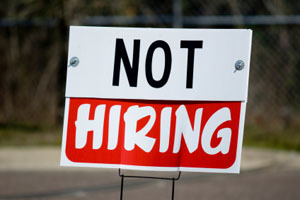 In either case, "the rich getting richer" creates job opportunities and supplies capital to start-up companies. Cutting taxes on the working class and providing an incentive for them to make money is the best way to help the poor because it directly benefits them through paychecks and loans. When the government taxes the rich and gives to the poor, there are unintended consequences. The welfare state created by the Democrats has inflicted unfathomable harm on the poor and is tearing at America's social fabric. A system where people live off the fruits of other's labor is not only morally wrong but has robbed the poor of their self-dignity. 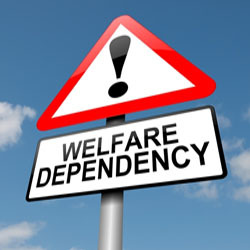 Welfare checks discourage people from seeking employment and inhibit overcoming hardship individually, a principal source of human fulfillment. A welfare check that pays for a car and cable television is wasteful and immoral. Learning the difference between hardship and suffering is crucial. The objective of promoting the general welfare of our nation is a noble cause desired by every political philosophy, but the machinery of government fails in achieving this goal because it requires someone else to efficiently and effectively spend someone else's money, an impossible task. According to Milton Friedman, ". . . no one spends someone else's money as carefully as they spend their own." This is the main reason why governmental instruments are futile in truly helping the needy. Though politicians often falsely assert that poverty is the fault of capitalism, government intervention has been prone to failure and has caused immeasurable adversity for the poor. Government policies must be judged by their result, not by their purpose. 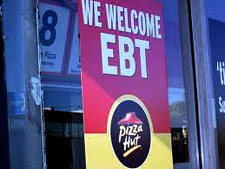 American history has shown that welfare programs have the opposite effect of what their well-intentioned sponsors hoped. Hunting, Farming and Fishing Assoc.